Oh dear. That is very bad indeed. I like his “Oh look, my hand’s on fire! Golly that hurts!” face. Flaming guitar takes down Tolkienesque hydra. Can’t get much better than that! I’m a Malmsteen fan too, but this is just hilarious. Please tell me that is a joke, and someone photoshopped that. Nice try, Bacon, but your cover’s blown. Looking at the face on that guy and looking at your Planet GNOME hackergotchi it’s obvious: you are Yngwie Malmsteen. Throw a wig on your head and on your chest and that’s you. Dude. This is awesome… It would be Yngwie if it didn’t look like that. For me I am cool withit. At least he is keeping the spirit of hair bands a live. I agree priest. We’re supposed to be his fans. And are you guys that pathetic to attack his weight? O.k. I’ll admit its not the best cover but does the cover have anything to do with the music its self? No. Bottom line Malmsteen has more talent then all you guys put together. 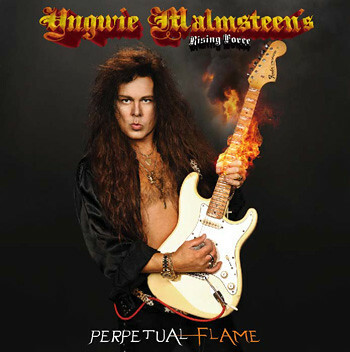 And if you have been a fan of him you wouldn’t be surprised with the cover, if have been to Malmsteen shows the pouty face and chest hair should come as no surprise. What a wanker. He keeps sucking in his cheeks.